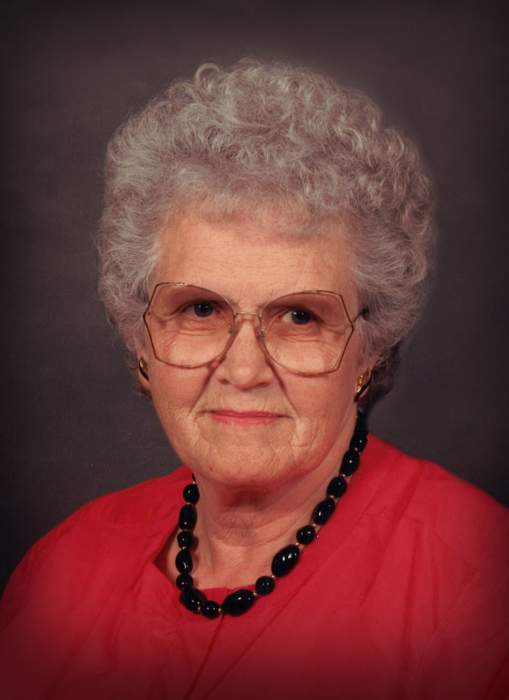 Thelma Fern Damlo, age 94, of Perham, MN, died Friday, October 26, 2018 at Perham Living, in Perham, MN. Visitation will be from 10:00-11:00 a.m. followed by the memorial service at 11:00 a.m. on Saturday, November 3 at St. Paul’s Lutheran Church, Perham, MN. Burial will be in St. Paul’s Lutheran Church Cemetery. Thelma was born November 1, 1923 on a farm in Thomastown Township, northwest of Staples, MN to Erick Wesley and Bessie Alice (Reynolds) Fuller. Thelma was named for a heroine in a book by the name of, “Thelma, a Norwegian Princess.” She walked up to two miles to get to District 80, a country school in Todd County. Because she was the only third grader at the school, her teacher moved her to the fourth grade where she always felt younger than the other students in her class. When Thelma was still a young girl, she moved to Minneapolis to help her Aunt Fern care for her aunt’s three children. During that time, she attended Sanford Junior High School and South High School in Minneapolis for grades seven, eight and nine. To get to school she rode the street car. She was confirmed at Holy Trinity Lutheran Church in Minneapolis, MN. In 1940, Thelma graduated from Staples High School. After graduation she attended a year of normal training (teacher training) in Staples. Following graduation, at age 18, she taught country school in Otter Tail County for three years. Two of the three years were in the New York Mills area where she boarded with Martin and Maggie Damlo. On June 10, 1944, she married Leonard Damlo at Balsamlund Lutheran Church, Aldrich, MN. They were blessed with four children, Gary, Linda, Arlen and Susan. Thelma and Leonard lived in Wadena for 30 years. During her life, she worked at Skalman Music, a laundry in Fergus Falls, the Brainerd Hospital, TGY lunch counter and did caretaking at Point North Campground near McGregor, MN for three summers. Thelma and Leonard built a house on West Battle Lake, MN. When they sold the property , they travelled and lived in their RV. Thelma volunteered at the Perham Memorial Nursing Home for ten years. Thelma’s interests included reading, as did her mother. She kept notebooks listing the books she had read so when she went to the library she could pick out new books to read. After developing macular degeneration, she ordered audio books from the Faribault School for the Blind and continued her love of books. Thelma made many, many quilts and crocheted many doilies and afghans over the years. She is survived by her four children, Gary (Candy) Damlo, St. Paul, MN, Linda Rautio, Park Rapids, MN, Arlen Damlo, Hackensack, MN, Susan Carlson, Faribault, MN; nine grandchildren; and several step-grandchildren. Preceding Thelma in death were her husband Leonard; her parents Wesley and Bessie Fuller; her son-in-law Jack Rautio; her daughter-in-law Nina Burke; her sister Lois Sulzle; and her brothers Robert and Melvin Fuller.